I rediscovered oatmeal a few years ago when I was staying at my dad’s house for a while before moving to Portugal. At the time, my baby sister was five years old and all she wanted to eat was oatmeal. Of course, I didn’t normally eat oatmeal because I was an adult, and oatmeal is for kids. Or at least, that’s what I thought until my dad served me up a giant bowl of hot oatmeal, topped with fresh blueberries, pecans, milk and of course, plenty of maple syrup. He always added butter and salt to his oatmeal, which created a perfect mix of sweet and savory. I’m pretty sure I melted after the first bite. Since then, oatmeal has been one of my favorite breakfasts. Here in Portugal, the most common breakfast is toast, or toast with butter, or toast with ham, or toast with ham and cheese, or if you’re feeling especially indulgent, toast with butter and ham and cheese! That’s fine most of the time, and Portuguese toast is probably the best toast in the world, but sometimes I need something more nourishing, comforting, and, well… oatmealy. Even on a warm, summer morning, I love to eat oatmeal topped with fresh fruit and cold milk. It’s a substantial breakfast without being too heavy. This is not really a recipe post, as I know that most of you probably know how to make oatmeal. Regardless, I’ll share how I make it and I want to encourage you to reintroduce oatmeal into your lives! Also, for any international readers who didn’t grow up eating oatmeal every day, give it a try! You might melt, just like I did. What are your favorite recipes from childhood? Any that you still eat as an adult? 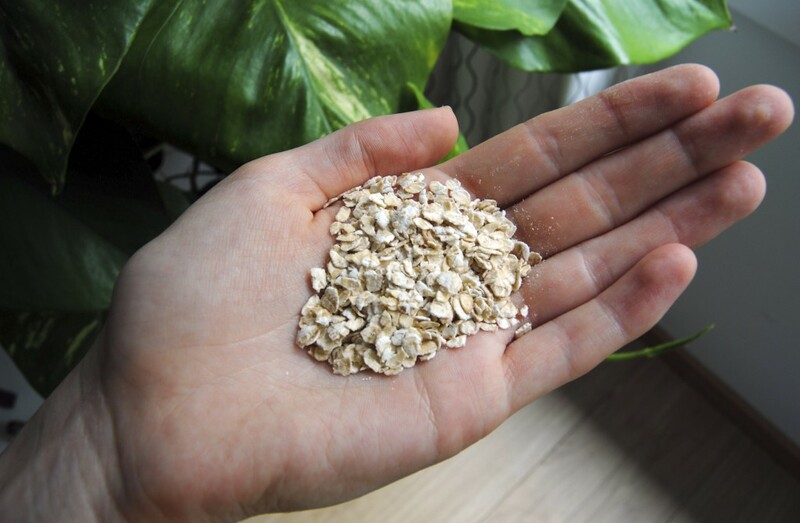 I prefer to use rolled oats, and I normally buy the finer variety (see below) simply because they cook faster and I’m often a bit crunched for time in the morning. Use whatever variety you want, though! I also eyeball my measurements when cooking oatmeal but it’s more or less a 2:1 ratio of water to oatmeal. Nowadays I usually leave out the butter because I forgot it once and didn’t miss it too much, but I still like the oatmeal to be just a tiny bit salty. The real “trick” to perfect oatmeal, for me, is to not mix in all the ingredients (not even the milk)! This way, every bite is a little different, nothing gets soggy, and you can get the perfect combination of textures. I eat it exactly as pictured above, with a little extra milk and maple syrup within reach in case I want to add some more. The possibilities for toppings are endless. I always use fresh fruit, mixed seeds (I always have a jar in the cupboard), milk and maple syrup. Sometimes I add chopped almonds. Any kind of nut milk would be wonderful as well, if you want to make this dairy-free. Bring water to a simmer, and add salt and oatmeal. Cook until most of the water is absorbed and the oatmeal is soft. If you want, stir in some butter at this point. 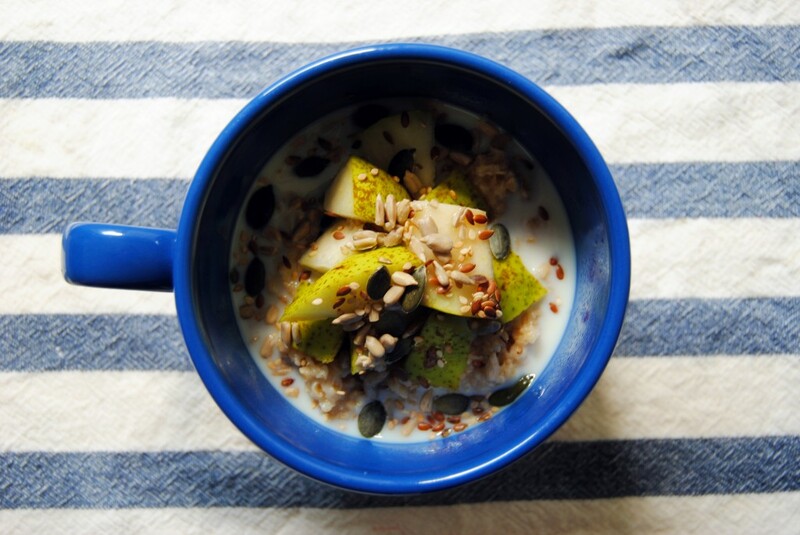 Put oatmeal in a bowl and top with fruit and seeds. Pour a small amount of milk over the top, and a drizzle of maple syrup. My recommendation: Enjoy on a lazy morning, with a very large cup of coffee. This is such a simple breakfast, but such a satisfying one. Sounds like a perfect breakfast with sweet childhood memories! Since I am in Greece I ate almost every day yoghurt with honey & müsli for breakfast – maybe also interesting to add yoghurt instead of milk?!? I’ve never eaten oatmeal with yogurt but I bet it would be delicious!